What about you: are you a weekend warrior or have you decided to join the Regulars on active duty? 1. The leader is always right and always in control. 2. The leader never accepts blame for anything. 5. Does not permit personal growth. Members talk alike, dress alike, have same mannerisms. Decisions are made for them. 6. “Service with a smile.” No matter what is going on in personal life, appearance is everything. Everyone must see you as being happy. No emotions allowed except that of happiness. These signs are adapted from an article in Discernment Ministry International’s Truth Matters newsletter, August 2003. Cleaning out my files last night I came across a sheet of paper with this written on it. I don’t know where I copied it from, but it sounds like it could have been written today. Most likely I copied it from some internet site. It’s some great teaching from Charles Spurgeon. An evil is in the professed camp of the Lord, so gross in its impudence, that the most short-sighted can hardly fail to notice it. During the past few years it has developed at an abnormal rate, even for evil. It has worked like leaven until the whole lump ferments. the devil has seldom done a cleverer thing than hinting to the Church that part of their mission is to provide entertainment for the people, with a view to winning them. From speaking out as the Puritans did, the Church has gradually toned down her testimony, then winked at and excused the frivolities of the day. Then she tolerated them in her borders. Now she has adopted them under the plea of reaching the masses. Lastly, the mission of amusement fails to effect the end desired. It works havoc among young converts. Let the careless and scoffers, who thank God because the Church met them half-way, speak and testify. Let the heavy laden who found peace through concert not keep silent! Let the drunkard to whom the dramatic entertainment had been God’s link in the chain of their conversion, stand up! There are none to answer. The mission of amusement produces no converts. The need of the hour for today’s ministry is believing scholarship joined with earnest spirituality, the one springing from the other as fruit from the root. The need is biblical doctrine, so understood and felt, that it sets men on fire. I suggest Willow Creek, Saddleback, “relevant” churches and “emergent” churches all take heed to what Spurgeon wrote. And always remember that the word “amuse” means “no think”. I have to admit that this book is fairly good overall, but where it messes with Scripture it is sometimes grievous in its error. With that said, let us begin to look at Pearl’s idea of what the Bible teaches. To begin with, Pearl uses the name “Jehovah” for God, which I am guessing is due to his KJVO stance. I think he should use Yahweh. Pearl apparently subscribes to the “Gap Theory” of creation, wherein there was a previous creation which was destroyed by a war with Satan, because he has Satan - who he erroneously calls “Lucifer” - rebelling and becoming Satan before man was created. (pp.2-5) Also, by being a proponent of the King James Version as the only correct English translation, Pearl ends up with much error in his understanding of what it says. Before proceeding farther, let me state that the name “Lucifer” comes only from the King James version of the Bible (and the New King James which keeps it) and the Latin Vulgate. The King James translators didn’t know what to do with the Hebrew word and simply transliterated it from the Vulgate. When Jerome was translating the Hebrew into Latin, he came across the word “Helel,” which means something like, “shining one” or “bright one,” in Isaiah 14:12. The passage described Helel as the “son of the dawn.” Jerome decided that Isaiah was describing what Jerome knew as the “morning star” (what we know as Venus). In Latin the name for this “star” was “Lucifer,” which means, “light-bearing,” so that is the word Jerome used to translate “Helel.” Modern translations all use “morning star,” “star of the morning,” “Day Star,” “shining one” or similar in their translations at this point, because “Lucifer” is a Latin name for Venus. It was never the name of Satan. So, what is wrong with Satan’s rebellion taking place before man is created? A couple things. First, the “gap theory” has been debunked from just about every scholarly point possible. It was a theory designed to fit long ages into the Bible, but it isn’t necessary to do this because those long ages supporting evolution are all theories in and of themselves with absolutely no proof. Secondly, since God called all of creation “very good” when He finished (Gen. 1:31), Satan could not have yet fallen. On page two there is an image that is supposed to be Satan, which is an angel with the head of a bull. Pearl’s belief that this is Satan’s real pre-sin appearance plays later in the story. This idea is purely fictional and extra-biblical. Because of his belief in the “gap theory,” Pearl has Satan and the demons watching as Adam and Eve are created. This has absolutely no biblical support and is just plain false teachings. Not reading his Bible, Pearl has Eve already created when Adam is told not to eat the fruit of the tree of knowledge of good and evil, and has God telling the both of them. But Scripture says Eve wasn’t created until after Adam received the command (Gen. 2:17). Pearl then has Satan telling Eve that if she eats of the fruit she will become “like the gods,” whereas Scripture says Satan said she would become “like God.” There is a big difference here in that Pearl has Satan teaching polytheism. Pearl depicts Adam and Eve believing God will kill them because God said they would die. (p.9) Then when God kills animals to make skins for clothes, Pearl says God killed the animals instead of Adam and Eve. From Scripture it is apparent that God had no intent to kill them. Apparently misunderstanding what the text says, Pearl has the curse of Satan including Satan’s “seed” and Eve’s child (p.8) to be enemies, whereas Scripture says the enemies would be the seed of both - not necessarily Eve’s child but rather her descendants. The artist depicts the cherubim guarding Eden as having a lion’s head (p.9). This is extra-biblical. Pearl makes the decision that the offerings Cain and Abel brought were sin offerings and that they were supposed to be sacrificed animals, supposedly based on Adam telling how God killed animals instead of killing Adam and Eve (p.10). However, there is nothing in Scripture saying that the animals were killed in their stead, nor is there anywhere in Scripture where it says Cain and Abel were offering such a sacrifice. Next, Pearl has God telling Cain that Cain will rule over his brother and Abel will be in subjection to him (p.11). This is nowhere in Scripture, but it is apparently Pearl’s misunderstanding of the passage (Gen. 4:7) where God tells Cain that sin is desiring him but that he must rule over it (“him” in KJV). Moving on to Noah, when he comes out of the Ark, Pearl has his sacrifices being for sin and to pay for the lives of his family (p.18). This is not what Scripture says, and shouldn’t be assumed. This is a common theme with Pearl; all animal sacrifices are in trade for the lives of the persons offering them. Pearl has Noah discover wine, as if before the flood no such fermenting of grapes took place (p.18). This is just silly. When Pearl is telling the story of the Israelites making an idol while Moses is on the mountain, he says they made it in the form of a bull because that is what satan looked like before he sinned (p.79). As noted previously, this is extra-biblical. Where Pearl gets this information is unknown. The next thing I found difficult to pass by is when Pearl is telling the story of the magi. He has three of them, as in the song “We Three Kings.” (p.166ff) Scripture tells us there were three gifts brought, but doesn’t say how many magi there were. While this could be passed over as artistic license, it tends to solidify the legend into fact for those who don’t know better. When Jesus is fasting in the desert, Pearl has him just then understanding poverty, hunger, being alone, sick, weak, etc. (p.175) This denigrates the deity of Christ; wouldn’t he as God already understand that? At the end of the temptation of Jesus, Pearl has Satan owning the world since Adam and Eve sinned (p.177). This is very common for those who believe in Strategic Level Spiritual Warfare and Deliverance ministries. However, Satan may be ruling the world, but he doesn’t own it. Many Scriptures tell us that all of Creation belongs to the Lord. Pearl does as many others do, which doesn’t excuse him, as he identifies Mary Magdalene as a prostitute (p.219ff). There is no Scriptural warrant for this charge against her. But Pearl conflates stories and has prostitution as the reason she is demon possessed. On page 236 Pearl puts Jesus’ words in the mouth of the woman who anoints him and washes his feet. He has her telling Jesus, “You are the resurrection and the life. He that believes in you will never die.” This gives Mary the origin of this very important citation by Jesus. When Jesus is being ministered to by the angel in the Garden prior to his arrest, Pearl has the angel paraphrasing Psalm 23 to Jesus: “Abraham and all the host of Paradise are awaiting you coming. They have prepared a table before you in the presence of your enemies; your cup runs over. Surely goodness and mercy will follow you and you will dwell in the house of the Lord forever.” (p.249). I think this is a bit ridiculous. The back of the book, several pages long, tell the story of why this particular book was developed, as well as a story depicting its use and success; I hope this book I have is not a version which goes to the field, as I don’t think this is appropriate. While many of these problems can be somewhat harmless, they can be misleading to those new to the Gospel. However, I feel Pearl’s handling of Genesis is grossly errant due to propagating false “gap theory” teachings, which undermines the literal teachings of Genesis. For me to recommend this book, the section on Genesis would have to be re-written. Is it wrong to celebrate Christmas, knowing that the celebration itself originated as a festival to placate pagans; a festival of Saturnalia “Christianized” but kept on the same day? Does the origin of a celebration pollute the current reason for a celebration? Is even the use of the name “Christmas” joining with pagans? In Exodus 11, God said to Moses that he is to tell the Israelites to ask their Egyptian neighbors for gold and silver jewelry when they are finally driven from Egypt after the 10th plague. In the middle of the next chapter we are told the Israelites did as they were instructed and the Egyptians gave them silver and gold jewelry, as well as clothing. Verse 36b says, In this way they plundered the Egyptians. Later, in Exodus 25, God has the Israelites giving gold and silver as part of the offerings for building the tabernacle. Gold was used for the Ark of the Covenant, the Table of the Presence, the lampstand and other furnishings. From where did this gold come? Obviously it came from the plunder of the Egyptians’. Here is a case of things taken from pagans, and perhaps even used in their worship, and then used for God’s honor and glory. Let’s look at Romans 14, often known as “the Law of Liberty.” It discusses how to handle “doubtful issues,” i.e., issues about which the Scripture doesn’t address. What Paul is saying here is that, although we have the Christian liberty to eat or drink, celebrate one day over another - or do anything else - if when we do it we cause a brother to stumble in his faith, then we should not do it. A brother or sister may be weaker in the faith and not understand Christian liberty in such matters, and if they see us exercising our liberty but think we are doing something sinful, it may cause them to do the same action but leave them with guilt as if they sinned. And even if no one is caused to stumble in that way, there is still stumbling into sin if those who exercise their liberty denigrate those who are weak, or if those who are weak denigrate those who exercise their liberty. Paul reminds the Romans that there is nothing unclean in and of itself (vs. 14) but that if someone thinks it is, then it is to that person because he lacks faith in that area, and if he lacks faith in what he is doing, then to him it is sin. Simply put, when we either exercise our liberty or are too weak to do so, our actions are to the Lord and therefore we are not to judge another person by our personal standards; it is before the Lord that we stand, and it is to the Lord we eat, drink, celebrate a day or not. Lastly, let’s look at 1 Corinthians 8, where Paul is addressing the issue of eating food sacrificed to idols. Paul points out that an idol is nothing - that only God is a true God. But, he says, not everyone has this knowledge, and that they have been eating such food for so long as an idolater that their weak conscience is defiled. Paul says that doesn’t make us inferior if we choose not to eat such meat, but at the same time he says neither does it make us superior if we eat it. However, as with Romans 14, he challenges the Corinthians to refrain from eating such meat if it will cause a weaker brother to stumble: Then the weak person, the brother for whom Christ died, is ruined by your knowledge. And Paul then makes the very strong warning that you are sinning when you cause that brother to stumble, and when you do that you are sinning against Christ. As with Romans 14, Paul is not saying it is wrong to eat meat which has been sacrificed to idols because we know an idol is nothing. What he IS saying is that if by doing so you will cause a weaker brother to stumble in his conscience, then you have sinned against that brother and against Christ. In Romans 14 and 1 Corinthians 8 we see that, according to God, everything is clean to eat, no matter who may say otherwise. Eat, drink, celebrate a day no matter what you know about its previous use for pagan idolatry because we know that idols are nothing in reality. HOWEVER, when exercising such freedom in Christian liberty, be sure you are not causing someone to stumble in his faith because of his weak conscience, not having the mature knowledge you have; if you do so, it is sinning. The Israelis plundered the Egyptian gold and silver - pagan items for certain - and used them for God’s glory. We can plunder meat from pagans and eat it to God’s glory, and we can plunder a celebration originated by pagans and celebrate it to God’s glory. Back to Christmas. The celebration of the birth of Christ did in fact originate in pagan beliefs which were “Christianized,” but since I know everything, including days, belong to the Lord because idols are nothing, then my Christian liberty allows me to celebrate such a day in a way that glorifies God. We can “plunder the Egyptians” of their “gold and silver” and use it for God. A last thought: What about the claim that we shouldn’t even use the title “Christmas” to denote the day because of its pagan origins? If it is important to God that we not use this title because of its pagan origins, then what do we as Christian use to name the days of the week? Or even the months? April probably comes from Apru, an Etruscan version of Aphrodite. Notice how many of the names for these days and months come from pagan astrology which names planets after their gods, while the rest are names of gods or pagan ceremonies. All the names of the week, and eight of the names of months, are of pagan origin, just as the name of Christmas is of “Christianized” pagan origin. What is a Christian to do?!?! Plunder the Egyptians, but don’t be unloving and cause a brother to stumble when you do so. Apologetics is more about honoring God than winning an argument. Scripturally speaking, the main purpose of apologetics is not to "win a case" like a litigator, because the "jury" may be hopelessly corrupt or distracted. Rather, apologetics is primarily a science for honoring the Lord by carefully studying and then accurately communicating His revealed truth (biblical, scientific, historical, etc. ), especially those truths that are questioned or opposed or misrepresented, ultimately trusting God to accomplish His good with the truths communicated. James. J.S. Johnson, "Understanding Effective Biblical Apologetics." Acts & Facts 39(4):8-9, quoting and explaining 1 Peter 3:15. cited in Acts & Facts Vol. 39 no.12, December 2010, p.8. Acts & Facts is a monthly publication of the Institute for Creation Research. Heresy does not usually start with a nose dive or a sudden fall, but is more of a drifting by small degrees. At times it is incremental and is an almost undetectable moving off course. The end though is always tragedy and loss. The Bible may scream, “Course correction!” but that is ignored. Truth is being sacrificed and lost. Scripture is our instrument check. It gives us our bearings and keeps us on course. It adjusts us back into proper alignment with truth and with God. It gives us all that is needed for doctrine, reproof, correction, and instruction in righteousness (2 Timothy 3:16). G. Richard Fisher, PFO Journal January-March 2011, Colossians: Today's Handbook on Heresy. The unsung heroes are really the apologists and Bereans of today. They may be ignored, marginalized, and criticized, but their voices will never be silent. They really care. They care for God’s truth. They care for God’s people. They care because they know the destruction that error and false teachings bring. What may not be obvious now will one day be obvious when the Lord issues the “well done” to those who have cared for His truth. This teaching is promoted by many teachers and many legalistic organizations, including Bill Gothard’s IBLP. It has become quite pervasive among Christians. This teaching claims that sins can be inherited by children, and some teachers go so far as to say the sins are caused by demons that must be exorcised, while most teachers of this doctrine say that the sins of one’s progenitors must be confessed and repented of. “Generational Sin” also teaches that if a progenitor was involved in witchcraft or some other occult activity, then the demonic forces pass down through their children. Some, such as Gothard, use this doctrine to say no one should adopt a child because you have no way of knowing what their spiritual ancestry is. What is the context of this passage? Idolatry. And it is about only "of those who hate me," a phrase conveniently left out by those who promote generational sin/curses. Also left out is the next passages, “but showing lovingkindness to thousands, to those who love Me and keep My commandments.” God shows mercy to thousands of generations that love Him. So is that also a "curse" passed down from father to son? The passage doesn't say God will curse them, it says He will "visit the iniquity," that is he will punish them with His judgment for as long as they continue worshipping idols and hating Him. So, if your great-great-grandfather was an idol worshiping pagan, and so was your great-grandfather and yet your grandfather became a believer, and so did your father, does that mean you have a generational curse on you because of your great-great-grandfather? Those who teach the doctrine of “generational sin/curses” say it does. But by their own reasoning, applying verse 6 once your grandfather became a Christian then thousands of generations would have God’s lovingkindness. Those who teach this passage as meaning sins of the fathers are passed to their sons have even less backing. These people claim that if a person is a drunk, then their children inherit their sin; if a person is promiscuous then their children will be the same; if their parent is a thief then they will also be. They neglect the fact that people learn to do what their parents do, not that they inherit their behaviors. This teaching is not only unbiblical, but spiritually dangerous. Did you know the Bible specifically tells us that having a Christmas tree is wrong, and that it is idolatry? No? Well neither did I. There are those who love to find all sorts of reasons in pagan rituals as to why we can’t use various symbols for Christmas celebrations. And I agree that many of the things we use for the Christmas season did indeed originate as part of pagan celebrations. But even if they did originate in that manner, is it really true that we can’t use such symbols for our own reasons and not the reasons used by the pagans? After all, isn’t all of creation God’s, and doesn’t everything belong to him? I submit, that for the most part, it is what we use things for that matters, not what the object is. A child can play with a doll while someone else can use it for worship; does this make the doll wrong or the heart of the user in the wrong? While a pagan may have used holly in idolatrous worship ceremonies, can I not use holly just for decoration? Just some thoughts to start you off with! What is the context? Is this a tree that is described? NO! They start with a tree, yes. But the passage says that a craftsman works it with a chisel. And what does he end up with? An idol! And one which is likened to a scarecrow which can’t speak or walk. It seems to be an image of a man carved from a tree! This passage is abused by legalistic Christians every Christmas in order to “prove” that a Christmas tree is something Christians should not have. What about the origin of the Christmas tree; is it pagan? I have read that there were indeed various pagan belief systems which used evergreen branches in their worship, and perhaps even used trees. But it is a non sequitur logic fallacy to say therefore the Christmas tree is of pagan origin. My understanding of the origin of the Christmas tree is that Martin Luther admired the beauty of the evergreen trees in the forest in the moonlight after a snow, and this led to a tradition of bringing a tree into the home to decorate it with candles to simulate the shine of the moon on the snow. It became a winter tradition in Germany to decorate with an evergreen tree, and, since Christmas happens during the winter, it became associated with Christmas. Whether that is the true story or not, does it really matter? Can I not decorate my house with plants without it being related to pagan worship? The main issue is, however, that the passage in Jeremiah has nothing whatsoever to do with a Christmas tree, and if you have been taught that it does, then you have been lied to. If you are teaching it, then you are lying to people. If you don’t want a Christmas tree, that is fine, but don’t tell others that having one is idolatry. Don’t twist Scripture to force a legalistic idea. 1. 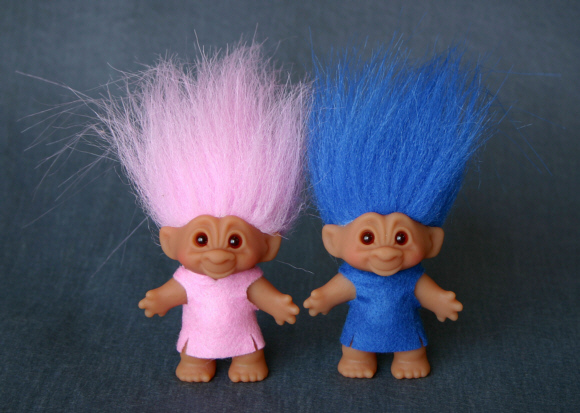 Bill Gothard, of the Institute for Basic Life Principles, states that items such as Cabbage Patch Dolls and troll dolls inhibit the birth of children. Midwives have had to cleanse all such "evil influences" from a house in order for a delivery to take place. Gothard states that Cabbage Patch Dolls have caused strange and destructive behavior in children, behavior which ceased once the dolls were removed or destroyed. He has stated that Cabbage Patch Dolls "are a violation of the First Commandment." [This is false because the 1st Commandment prohibits the making of idols, which Cabbage Patch Dolls aren't.] Gothard also states that "there are demons attached to the idols" in 1 Cor. 10:19-20. Many Christian homes, due to ignorance, have become houses of worship for demon gods. God has provided the sacrifice of Jesus Christ to atone for our sins, and His blood cleanses and protects all who accept Him as Savior, but He will not live in our homes if He must share them with demon gods. Many Christians, due to ignorance, expect Him to do just that. They have given room to other gods without intending to do so and now suffer the effects of this contamination. This often happens as Christians return from travels around the world, or from shopping at various international import stores, carrying demons in their shopping bags. 5. Animist figures and art from the shamanists of Mexico. These things were created and named for the worship and veneration of evil spirits, not God. Even if you say, "Well, I certainly don't worship them," you still owe God an explanation of why you openly display them in the rooms of your house. That was the custom of Canaan, a practice that still dominates many religions around the world. I'm telling you, God will not play house with devils or the stuff of devils. Neither will He continue to grace your home if you refuse to clean out the rest of the filth that contaminates it. 3. Albert James Dager, in the Media Spotlight special report on the deliverance ministry, also claims that "Some objects used in the ceremonies of pagan worship are fetishes to which demonic spirits are attached." While he says nothing in that article about other objects or idols being "possessed," this particular statement harms his credibility. 1. 1 Sam. 12:21 Do not turn away after useless idols. They can do you no good, nor can they rescue you, because they are useless. 2. Ps. 115:4-7 But their idols are silver and gold, made by the hands of men. They have mouths, but cannot speak, eyes, but they cannot see; they have ears, but cannot hear, noses, but they cannot smell; they have hands, but cannot feel, feet, but they cannot walk; nor can they utter a sound with their throats. 3. Is. 44:8-20 You are my witnesses. Is there any God besides me? No, there is no other Rock; I know not one. All who make idols are nothing, and the things they treasure are worthless. ... Who shapes a god and casts an idol, which can profit him nothing? He and his kind will be put to shame; craftsmen are nothing but men. ... The blacksmith takes a tool and works with it in the coals; he shapes an idol with hammers, he forges it with the might of his arm. ... The carpenter measures with a line and makes an outline with a marker; he roughs it out with chisels and marks it with compasses. He shapes it in the form of man, of man in all his glory, that it may dwell in a shrine. He cut down cedars, or perhaps took a cypress or oak. He let it grow among the trees of the forest, or planted a pine, and the rain made it grow. It is man's fuel for burning; some of it he takes and warms himself, he kindles a fire and bakes bread. But he also fashions a god and worships it; he makes an idol and bows down to it. Half of the wood he burns in the fire; over it he prepares a meal, he roasts his meat and eats his fill. He also warms himself and says, "Ah! I am warm; I see the fire." From the rest he makes a god, his idol; he bows down to it and worships. He prays to it and says, "Save me; you are my god." ... No one stops to think, no one has the knowledge or understanding to say, "Half of it I used for fuel; I even baked bread over its coals, I roasted meat and I ate. Shall I make a detestable thing from what is left? Shall I bow down to a block of wood?" He feeds on ashes, a deluded heart misleads him; he cannot save himself, or say, "Is not this thing in my right hand a lie?" 4. Is. 45:20 Ignorant are those who carry about idols of wood, who pray to gods that cannot save. 5. Is. 57:13 When you cry out for help, let your collection of idols save you! The wind will carry all of them off, a mere breath will blow them away. 6. Jer. 2:5 This is what the Lord says: "What fault did your fathers find in me, that they strayed so far from me? They followed worthless idols and became worthless themselves." 8. Jer. 16:19-20 Our fathers possessed nothing but false gods, worthless idols that did them no good. Do men make their own gods? Yes, but they are not gods! 9. Hos. 4:12 They consult a wooden idol and are answered by a stick of wood. 10. Hab. 2:18-19 Of what value is an idol, since a man has carved it? Or an image that teaches lies? For he who makes it trusts in his own creation; he makes idols that cannot speak. Woe to him who says to wood, "Come to life!" Or to a lifeless stone, "Wake up!" Can it give guidance? It is covered with gold and silver; there is no breath in it. 11. 1 Cor. 8:4 We know that an idol is nothing at all in the world and that there is no God but one. 13. Rev. 9:20b ...they did not stop worshiping demons, and idols of gold, silver, bronze, stone and wood - idols that cannot see or hear or walk. What can we conclude about idols from the above? They are "useless" and "worthless." They are lies and have no abilities, no attributes, and are certainly false gods. Isaiah makes a good point that people are foolish to use half of the wood for fuel and worship the other half; that it's all the same block of wood. Idols will blow away. They are frauds and objects of mockery. Paul even says they are "nothing," that they are not anything. I think the most important passage is from Jer. 10: Do not fear them; they can do no harm nor can they do any good. God's instructions to Israel to be rid of idols is something that Christians should probably also adhere to, if they know something was indeed used as such. However, there is no Scriptural evidence that an idol itself has evil influence; an idol is nothing, can do nothing and has no character. Technically speaking, from the viewpoint of Scripture, someone could collect and display idols for educational purposes. Only Israel was given the command to destroy all idols, and that was to prevent the worship of them. What I understand this to say is that, since the idols themselves are nothing, the worshiper is really offering his sacrifices to the demonic realm, which can be done with or without an idol present. The idol is merely what the worshiper focuses on, but it is not the demon itself, nor is a demon attached to it. As an example, until I was almost 30 years old, I never knew kachina dolls were copies of what some Indians used as idols. My mother and father purchased some during trips out west and they were just displayed as curios; I always thought they were just dolls Indian kids used to play with! Since I ascribed that identity to them, were they any longer idols? Would God have been displeased with them in my house? I think the fact that Scripture says idols are just blocks of wood would rule out that God would be displeased. Not all the items listed by Kilpatrick can be categorized as idols. Most of them are just items of superstition which aid in occult activities; the drum, especially, could be used for any music activity, not just occultic. But items are just inanimate objects and only take on the meaning given to them by the user. The various charms and dolls may be collected by someone who has no knowledge of their origin or trait assigned to them. They then become no more than a curio or toy to the person who has them. Someone could use a GI Joe doll for a voodoo doll, but that doesn't make a person who buys it used at a garage sale a partaker in evil, nor would it bring evil influence into the buyer's house. There is no evidence in Scripture of demons attaching themselves to or inhabiting objects. All examples I found in the Bible are of people being possessed; never is there an example of an object being possessed. Animism is nowhere to found in the Bible. The belief that toys can create evil influence is nothing more than superstition and animism (the belief that spirits inhabit objects and places). Both are incompatible with Christianity. Just because some culture believes four-leaf clovers bring luck, that doesn't mean someone who collects them is now under an evil influence. Belief in something does not make it true; animists also have idols, which from Scripture we learn are nothing. If the theory that demons are able to attach themselves to items used by someone for occultic practices was true, then no one would be safe buying any used item of any sort; there would be no way of knowing if the previous owner had used it for occult purposes. If objects had the power of evil, would not God have warned us?